Finding Shelter is a story about the symbiotic relationship animal shelter volunteers share with their canine dependents, and the beautiful care taking that hap­pens between the two species. More importantly, it is an opportunity to rebrand our nation’s animal shelters and unveil the truth: that shelters are a place of love, warmth and healing full of animals who are ready and willing to fill your life with joy. Without volunteers, our nation's animal shelter system simply would not exist. Volunteers speak for those that cannot speak, pick up the pieces for abandoned animals that have been let down by previous owners or unfortunate circumstances, and do whatever it takes to heal the deepest of wounds. 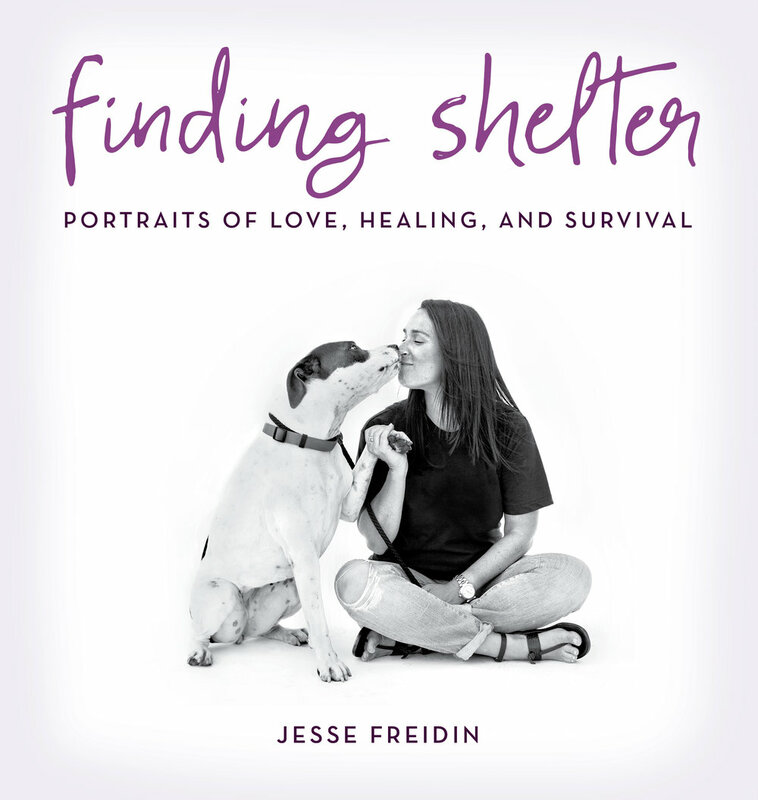 Finding Shelter is award-winning photographer Jesse Freidin's tribute to the softer side of the shelter system story, told through its volunteers and the animals they have saved. After photographing shelter volunteers in California for an entire year on his own dime, Jesse launched a Kickstarter campaign in 2015 to fund the creation of a book and support a cross-country expedition for the project. Kickstarter chose it as a 'Staff Pick' on it's first day live, the project went viral, the fundraising goal was exceeded and Lyons Press offered a book deal. The beautiful hardcover Finding Shelter book will be published by Lyons Press in April 2017, with proceeds going to all shelters involved. It features 100 black and white portraits of volunteers and shelter dogs across the country, as well as their heartwarming stories of love and survival. Book signing events and exhibits will follow the launch of the book in April 2017. Hope to see you on the road! Jesse Freidin is one of America's leading fine art dog photographers with work in more than 100 private collections throughout the United States. His portraiture has been exhibited in galleries across the country, and studies the deeply healing power of the human/animal bond— telling a contemporary story of companionship and love that truly honors the role dogs play in our modern lives. Jesse was awarded 'Best Dog Photographer in the San Francisco Bay Area' and 'Best Dog Photographer in Los Angeles' for fine art pet portraiture in 2010 through 2015. He is also the creator of three viral dog photography series: The Doggie Gaga Project, When Dogs Heal, and Finding Shelter. His work has been featured in Vogue, Cosmopolitan, The Huffington Post, Yahoo!, MTV, Live! with Regis and Kelly, Inside Edition, The Bark Magazine, Dogster, Garden and Gun Magazine, Four and Sons Magazine and many more. He works with private dog photography clients across the country, and is an avid supporter of animal rescue. Please consider getting involved with any of the amazing groups featured in this project— either by becoming a volunteer, donating, or adopting. All images copyright: Jesse Freidin Photographer 2016. Reproduction of images or content without permission is prohibited.